Roasted Red Bell Peppers are a treat! 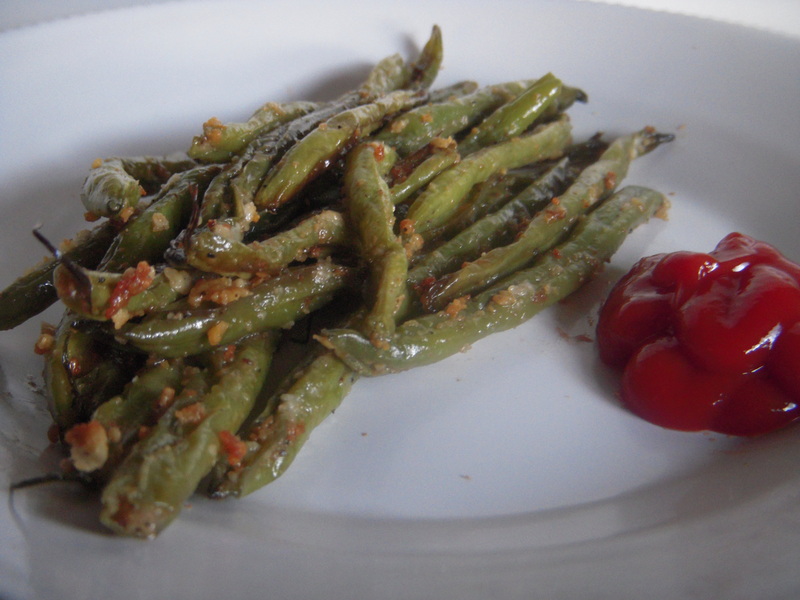 They have a mildly sweet flavor and are a wonderful addition to sandwiches, salads, pastas, etc. Once the peppers are roasted and the skin is removed, you can keep the peppers in a jar to use anytime. In this case, I stuffed them with some goat cheese, pine nuts and raisins. The flavor was delicious! 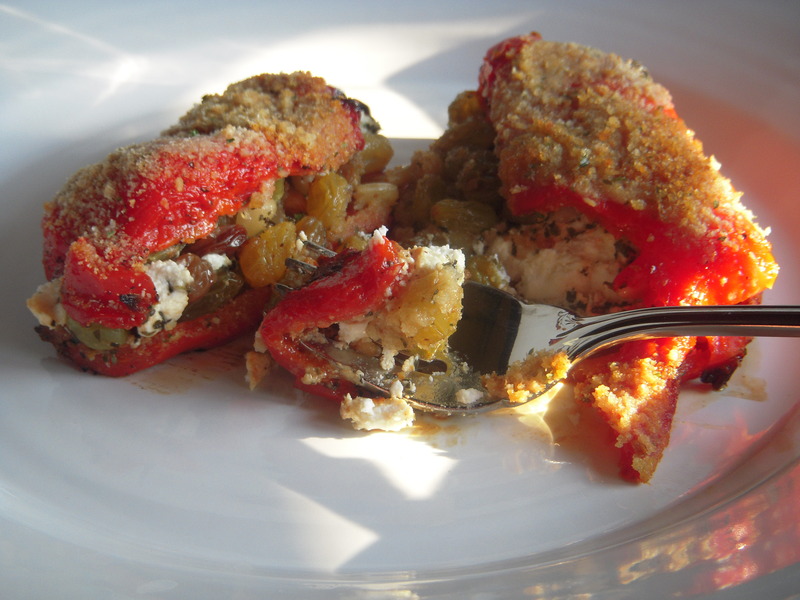 These stuffed red peppers can be served as a main dish or as an appetizer or side. Place whole peppers on pan in oven and broil until all sides are blackened, turning after about 10 minutes. Once all sides are blackened, remove from over and put into a brown paper bag or covered bowl. The steam helps to loosen the skins and makes them easier to peel. When peppers are cool enough to touch, cut off stem and squeeze gently to help remove seeds. Place the peppers peeled side down and flatten them slightly to keep open. Spread the goat cheese evenly down the center of each pepper, forming it into a log shape. Top the goat cheese with the basil, evenly distributed among the peppers, followed by the pine nuts and golden raisins. Fold the peppers to close and press down slightly to hold shape. Place the peppers on a baking sheet and sprinkle with the bread crumbs and olive oil. Bake at 450 for about 10-15 minutes, or until the bread crumbs begin to brown. Remove from oven and let cool enough to handle. Serve as a main dish with some pasta or couscous. Or, try them as an appetizer. Either way, I hope you enjoy!! Many restraunts serve a version of a tomato stack salad. If you ever see it on the menu, you should order it! Brad and I have loved every one we can remember. I decided to create my own version of a tomato stack. I used fresh tomato, avacado and corn vinegarette, topped with a lemon garlic sauce. It was wonderful! Arrange one tomato slice on each plate. Top the tomato with a spoonful of corn vinegarette then 2 slices of avacado. 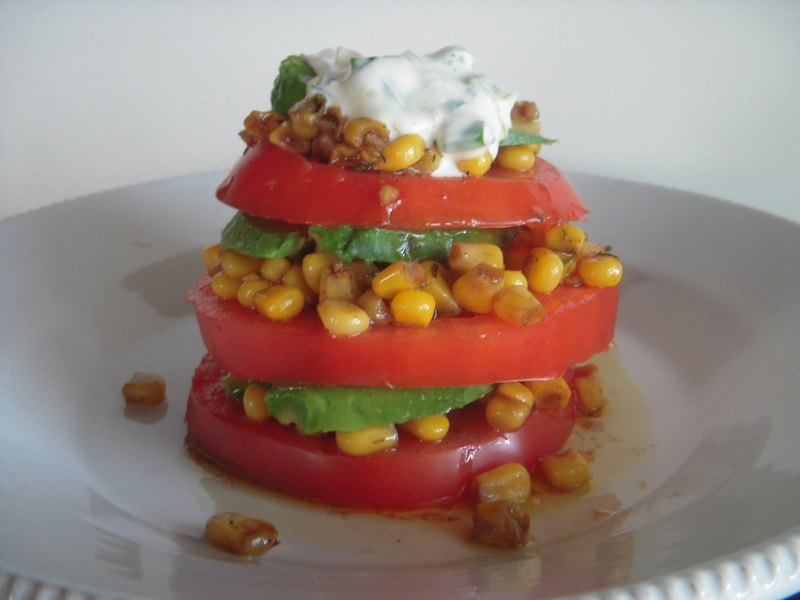 Repeat tomato, corn, avacado two more times then top the tomato stack with a teaspoon of the lemon garlic sauce. Drain corn well and combine with olive oil, balsamic vinegar, garlic, sugar, creole mustard and thyme. Toss. Butternut squash are hearty, healthy and delicious. This vegetable is packed with Vitamin A, Vitamin C, potassium and fiber. This is a simple recipe I use quite often. We usually eat the roasted butternut squash, then add the leftovers to some pasta, risotto, or even as a topping on a pizza. If you have never bought a butternut squash before, look for a long, light orange, pear shaped squash. Peel the squash. Cut the squash lengthwise and discard the seeds and pulp area. Chop the squash into 1 inch cubes. Arrange squash on a lightly greased baking sheet. Sprinkle the squash with the garlic powder and basil. Drizzle the olive oil over the squash. Bake at 400 for about 20 minutes. Flip the squash and continue baking until they are soft or crispy. You decide!…Hope you love it! Brussel Sprouts are one of my absolute favorite vegetables! I have found so many delicious and simple ways to prepare them. Not only are they the perfect side, snack or even meal, they are packed with nutritional benefits. Brussel sprouts are loaded with Vitamin K, Vitamin C and many other phytonutrients that are said to prevent cancer. They are also very low in calories but keep you feeling full from the amount of fiber and protein. 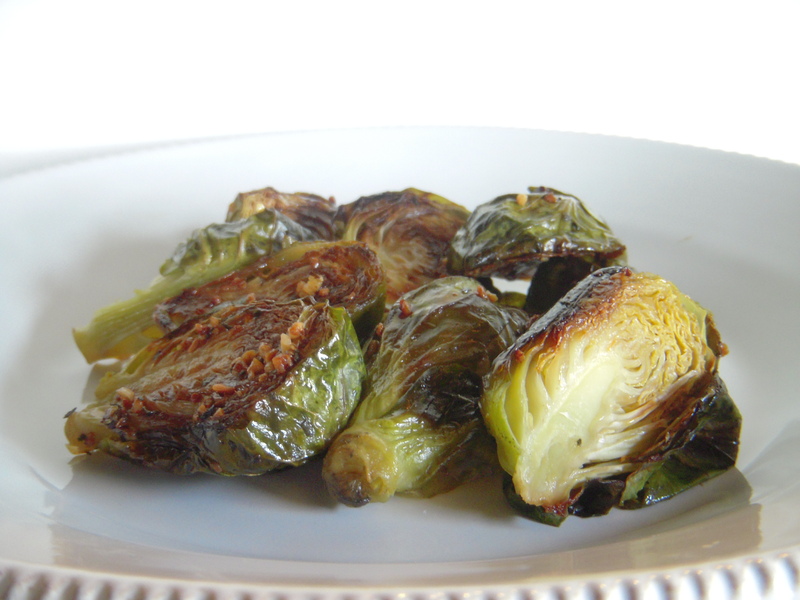 Today I am going to share one of the most basic ways to prepare your brussel sprouts. I love to cook a whole bunch at a time and keep the leftovers in the fridge for a few days to snack on. Brad never knew he would be eating brussel sprouts at least 2-3 times a week and LOVING it!!! Wash the brussel sprouts then cut in half, lengthwise. In bowl, combine brussel sprouts with olive oil, garlic and salt. Toss to coat. Lay brussel sprouts in a single layer on lightly greased baking sheet. Bake at 400 for about 20 minutes then flip and continue baking until softened and slightly crispy.